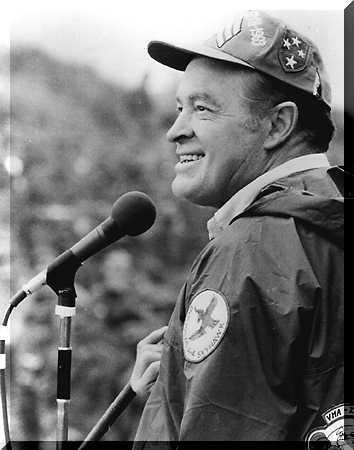 The Bob Hope I admire and would like my daughter's generation to respect is found from a purely historical perspective... his U.S.O. work is an astonishing achievement. He didn't prolong or encourage war, as was said during Vietnam; he brought welcome relief to the soldiers in the dirt and consoled countless families of those who didn't make it back. During World War II, he didn't limit himself to training camps and safe territories, but inched as close to the front as he was allowed, never giving himself or his staff a break. His standard opening on entering a hospital filled with paraplegics was, ''Don't get up.'' A man has to have a special kind of empathy to get away with that. Hope's U.S.O. work is lasting for another reason. At his best, he was a marvelously loose-limbed and irresistible performer, fast on his feet and relentless in his energy; some of his finest work is found in film shorts and newsreels that capture him on the plank stages of World War II. Still, the best part of his artistry survives in his films. Hope was the great comic actor of the 1940's, an original whose persona often transcended lame scripts. He can still get you with his gangly physicality, his many shades of discomfort, fear or lechery, the trademark gurgle, the off-handed badinage with Crosby and the luckless romancing with any number of sham femme fatales.